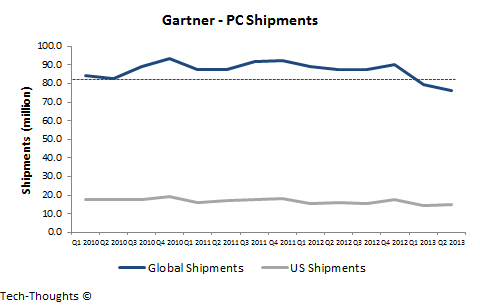 Gartner & IDC reported their PC shipment estimates for Q2 2013 and the figures should be cause for alarm. Shipments came in even lower than the figures in Q1 2013 (which were the lowest shipment figures in over 3 years). Let's take a look at how these figures fit in with my previous shipment estimate based on the tablet-PC substitution rate. In my substitution rate estimate, I had estimated PC shipments for the rest of the year in two scenarios - 1) Tablet-PC substitution sees a gradual decline, 2) Tablet-PC substitution sees consistent growth. PC shipment figures for Q2 came exactly between the predicted levels in both scenarios, i.e. the substitution rate pattern should have remained flat. We can confirm the state of the substitution rate once tablet shipment figures are released later this month. Based on the substitution rate trend we extracted from the smartphone market, Q3 should be an inflection point which decides the scale of the PC industry's decline over the next few quarters. Another quarter with a flat tablet-PC substitution rate trend could send PC shipments down to ~65 million units. Meanwhile, a decline in the substitution rate would help PC shipments stay above the 70 million level. IDC expects some improvement in PC shipments in the second half of the year as there was some inventory reduction in Q2. However, it also admitted that PC OEMs are being cautious as the industry has been declining for some time. Analyst firms have been expecting the PC industry to rebound for more than a year now, and I don't expect that to happen as the reason for this decline is an irreversible, secular shift in computing patterns. This trend has been driven by consumers as they are not as demanding as enterprise customers. As technology continues to improve, increased substitution of PCs by tablets in higher market tiers (power users, SMBs) is a very likely scenario.